Ever wonder how to dye yarn? My first experience dying yarn wasn’t exactly a success but through that experience I learned that there are crucial steps to the process. Dying yarn can be a great Sunday funday project if your hands need a break from your current WIP. Who knows, it may even become a new hobby for you! I’m thrilled to chat with Ali of Explorer Knits this week on the podcast! It’s certainly a conversation I wish I had (or heard) before I tried dying my first hank of yarn. You’ll hear about that interesting experience too! Ali runs through it all from what yarns to experiment with first, the different dyes and which you should use as a beginner and then she walks us through the entire dying process. It’s much easier than you might think! Now if you haven’t done so already, click on that play button at the top of the page to hear from Ali! Red Heart Chic Sheep Yarn by Marly Bird! Give dyeing yarn a try with some linen or lace Chic Sheep yarn by Marly Bird. 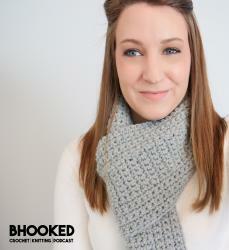 Check out Chic Sheep Yarn by Marly Bird at your local store or order directly on their website or from Redheart.com!